More than 3.1 million adults visited an acupuncturist in 2007, a figure that has risen sharply over the past decade. In 1997 there were 27 visits to an acupuncturist per 1,000 adults compared to 79.2 visits in 2007. To remain at the forefront of truly patient-centered integrative medical care, outreach is an important tool for building awareness about acupuncture’s safety and benefits. The links below are a toolkit developed by the Council of State Associations (CSA) Public Education Committee, and the Maryland Acupuncture Society Public Affairs Committee. wellness promotion. You can also download free and steeply discounted, customizable AOM Day materials from Acupuncture Media Works. The Council of State Associations - of which MAS is a member - will receive 5% of all paid materials to support future public education initiatives. Click this Link to see the Maryland AOM day Proclamation signed by Maryland Governor Martin O'Malley! 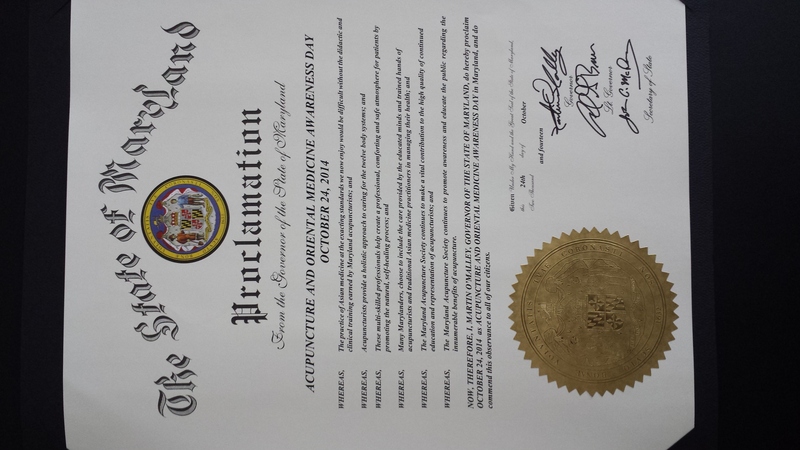 A request was sent by the Maryland Acupuncture Society Vice President for Public Affairs to Maryland Governor Martin O'Malley, requesting a proclamation recognizing October 24 as Acupuncture and Oriental Medicine Awareness Day in the State of Maryland. Click this link for the Request for AOM Proclamation. Click this link to download the AOM Day Logo.